Your washer is on the brink—or, maybe, it is your dryer. Or, maybe a kitchen appliance like a refrigerator, stove, dishwasher, or even a microwave. Now what?! Think Mr. Appliance® of The Palm Beaches! You have seen our vans around town and in your neighborhood and for good reason. Your community trusts us, and you should too. We are family owned and have deep roots in the local community. Our location’s owner, Matthew Beatty, has a long-term history in the appliance repair business. Matt's parents ran a successful appliance repair company for nearly 30 years before selling the business to Matt in 2005. In fact, Matt grew up riding around in appliance repair trucks and spending his summers learning from his father. We focus primarily on keeping your appliances humming so they can last for their full life expectancy. By keeping your machines in top condition, we help you save money by helping you avoid replacing them early. In addition, we help you save money on gas and electricity by keeping your energy-efficient appliances running at optimal level. 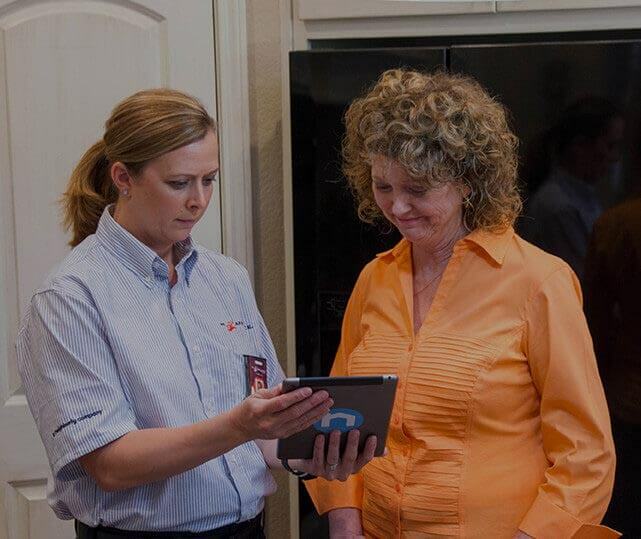 All of our technicians are prompt, efficient, highly-trained, and factory-authorized on all major brands of appliances. This ensures all repair work is quick. We have a five van fleet available for all service calls. We can services all major brands, including premium brands like Sub Zero, Miele, Wolf, Viking and others. With us, there is no diagnostic charge with repair. You will receive a fixed quote with no overtime charge. We will guarantee all works and parts for one full year. In addition, we have warranty service available. Unlike other repair shops, we have access to factory assistance, which is due to our long history in the business and personal relationships that we have built. The job we do is designed to get the job done without disrupting the home—meaning we are committed to leaving no trace behind. To accomplish this, every technician wears shoe covers and places protective mats before bringing out any tools. In addition, we clean up after we are done! Please do not hesitate to call (561) 513-4430 today if you would like to request a service appointment. We serve Palm Beach County, including West Palm Beach, Boynton Beach, and Lake Worth.